Recently I took the opportunity to remind a group of professional speakers that being a powerful and authentic speaker is not so much about what they have to say, it’s more about the connection they can make with their listeners. 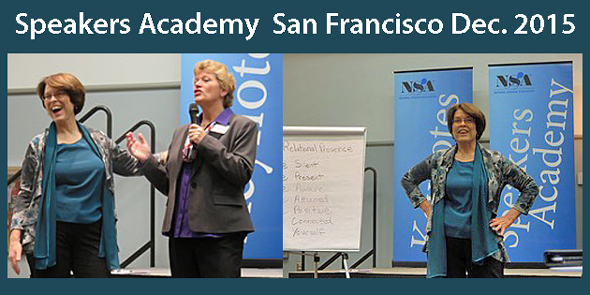 These professionals, enrolled in the Speakers Academy sponsored by the National Speakers Association, are eager to learn platform skills so they can effectively deliver their messages to their audiences. I was honored to be invited to coach them toward more authentic presence and connection. To be present and make a connection with a listener, a speaker needs to take the focus off of the script that is in their head, come into the present moment, and place their primary attention on one person at a time in their audience while they speak. The delivery then becomes much more conversational, more real and less of a performance. But the question is, how do you do that as a speaker and remember what you want to say? Especially because if you’re being hired as a professional speaker to speak to an association or organization to the tune of several thousand dollars, you’re really there to share your message in a way that accomplishes the goals of the person who is signing your check. So you have to make sure that you remember to do and accomplish what you say you’re going to do for the organizer. Yes, it’s important to have your major points organized and well defined so they are at your finger tips, but you have to be able to engage person-to-person in the moment to reach your audience. Otherwise, when speakers are attached to their script, we can feel that is where they are…in their head, remembering the words they’ve rehearsed, and they are not making a connection with us. Learning to be present with yourself and connected to your audience takes practice. It’s like developing an inner muscle. If this muscle is strong, you will quickly be present in the moment and able to speak authentically at the same time. Developing the strength of your inner presence muscle is what we do at a Speaking Circle. This is a place where you can practice putting more emphasis on a one-to-one connection, letting go of your script, and discovering how your words are already there, ready to be shared. Here is a simple tip to remember… you have to stop, look, and listen to your listeners so that they feel included. In this way you become like a magnet that will draw your audience to the exciting and inspiring material you want them to hear. If this post has been useful, please comment below and share it with others.